The event took place at El Naranjo Turtle Camp, located past La Peñita de Jaltemba. That evening seven survivors were released into the sea. It was twenty years ago that the last black turtle nest was registered at El Naranjo Turtle Camp, located to one side of La Peñita de Jaltemba. 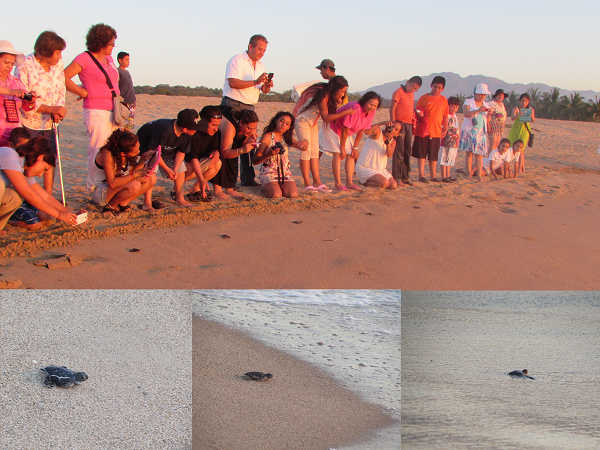 Now on April 22nd, seven tiny black turtles were released in the Riviera Nayarit. Forty eggs were reportedly found at the camp 84 days ago, which were duly taken care of until they hatched. From that total, only half of them actually hatched and only seven hatchlings survived. Normally, this species takes between 50 and 55 days to hatch, but the local weather conditions delayed the event. “This is the second black turtle nest we were able to collect. It was a meter and a half in size and weighed 120 kilograms. It’s not very common for these turtles to reach our shores, as they usually prefer the beaches at Colola, Michoacán,” explained Ricardo Villaseñor, Secretary of the Nayarit Ecologists Group and part of the group that operates the camp. Although it’s not a given that these cold-blooded reptiles return to nest in the place where they hatched, it could happen: it takes 20 years for a black turtle to reach its sexual maturity and one of the previous hatchlings could have returned to lay her eggs on the shores of the Riviera Nayarit. “It’s a very important event for us, as we have already registered several species including the leatherback, Ridley, Hawksbill and black turtles. These are four out of the seven species that usually nest on this beach, already considered a very important sea turtle hatching area,” added Villaseñor. “When you see a turtle nest hatching please do not touch it and do not gather the hatchlings. What you need to do is simply observe them and ensure they make it to the water. When the turtle is actually laying her eggs the same notion applies: just observe and let her do her job,” recommended Richard. This request to not touch them is not just to avoid harming the turtles, but also because people can be at risk of being contaminated with HPV, as reptiles are occasionally carriers of this contagious virus. The Riviera Nayarit Convention and Visitors Bureau urges the community to take heed of the recommendations posted by the authorities and not to forget that should anyone choose to disturb the cycle of nature they would be committing a Federal offense if they steal or harm any part of the turtle.